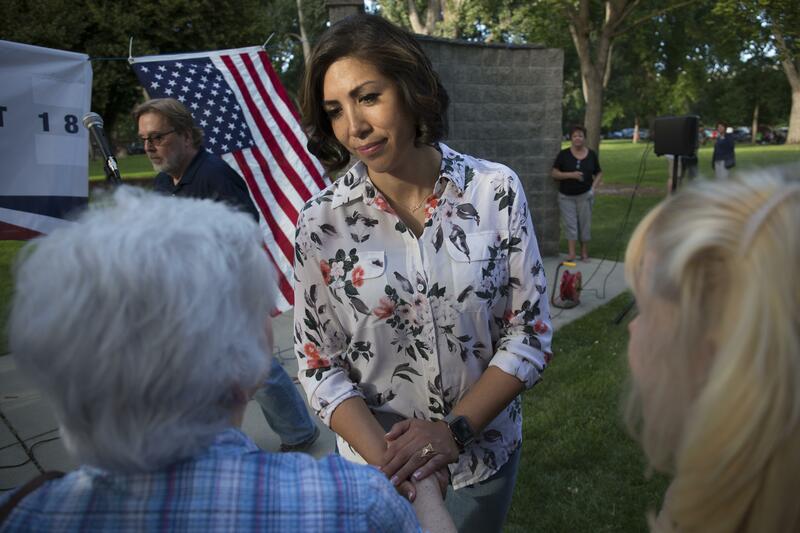 Paulette Jordan, the Democratic candidate for governor, is calling for Idaho to enact a law similar to a longstanding one in Utah that makes any road that’s been used by the public for 10 years officially a public road – whether or not private landowners object. Brad Little, the Republican candidate and Idaho’s current lieutenant governor, opposes such a move. Hauge said there are “nine different ways” for a road to become public in Idaho. Jordan made her proposal last week after news that two Texas brothers who have bought up large tracts of land in Idaho have gated off a popular forest road north of Boise, just before the start of fall hunting season. Utah’s law, by contrast, has no public road-maintenance requirement. “If for any 10-year period, a road was used by the public in Utah, the road becomes a public road,” said Brent Bateman, director of the Utah Office of the Property Rights Ombudsman, a state agency. Billionaire Texas brothers Dan and Farris Wilks put up padlocked gates and “No Trespassing” signs blocking a Forest Service road near Bogus Basin in the Boise National Forest that’s popular with hunters, ATV riders, motorcyclists and bicyclists, the AP reported last week. A forest spokeswoman said the agency has reached out to the brothers and hopes to reach an agreement on access. Christopher Meyer, author of the Givens Pursley manual, said if Idaho were to change its law, it likely wouldn’t be retroactive – so it might not address something like the current Wilks situation. Idaho’s state Ed Board has been working for three years on a new formula, Freeman said, based on the idea “that we should be paying for what we value”: students graduating and becoming valuable members of the state’s workforce. The formula would provide payoffs to higher education institutions based on the number of students who graduate with degrees or certificates. It also, on a weighted basis, would provide extra boosts for students who complete studies in “high impact” and high-need fields, such as STEM fields; for at-risk students who complete degrees or certificates; and for students graduating on time, including earning a bachelor’s degree in four years. The formula would apply to all levels of higher education in Idaho: colleges and universities, community colleges, and career-technical education. It also would phase in a program to put a portion of each institution’s funding “at risk” if it doesn’t meet outcomes-based goals, Freeman said, by rolling that portion of the institution’s funding into the formula. Idaho Republican candidates will join on a campaign bus tour of the state starting Oct. 17, the Idaho Republican Party has announced. The tour will begin with a breakfast at the Basque Center in Boise, then hit stops throughout the Treasure Valley that day, in North Idaho the next two days, then back down into southern and eastern Idaho through Oct. 27. Local and statewide candidates will join portions of the tour; the schedule is online at idgop.org. Betsy Z. Russell is the Boise bureau chief and state Capitol reporter for the Idaho Press.